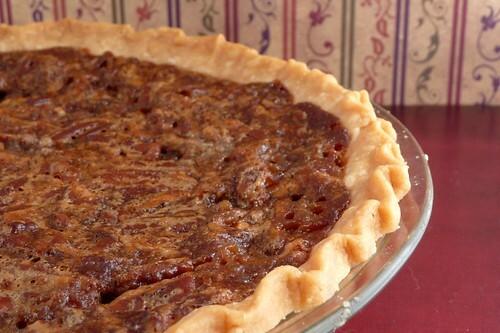 I’ve made a lot of pecan pies this year. My dad loves them so every couple of weeks I make another pie. I wasn’t satisfied with making the same recipe over and over again because I wasn’t satisfied with the way the recipes were turning out, so I’ve been trying a different recipe almost every time on him, looking for the right one. My favorite is still the Maple Pecan Pie but it uses a lot of (expensive) maple syrup, so I’ve been looking for one that was almost as good. I’ve tried traditional Southern recipes with molasses (those were okay but not great), I’ve tried cooked and uncooked recipes. So far, most have been simply “okay”. Some he liked better than I did, some I liked the raw filling more than he liked the cooked. This one from Bakerella we can both agree on. It’s easy and doesn’t call for any expensive ingredients. (Actually, I probably made it more expensive because I don’t like using margarine.) The original recipe made 3 pies! If I had 3 pie dishes, I’d consider it because he goes through pies so fast. And, most importantly, this one got the highest reviews after the maple pecan. I loved the filling and he loved the end result. 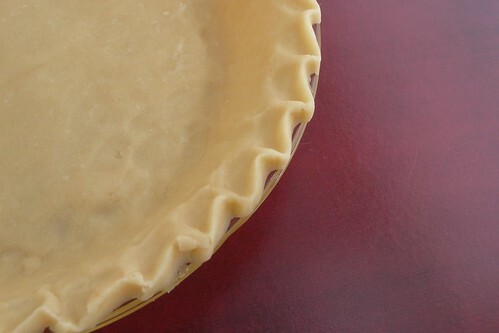 I normally refer you to Food Network for Alton’s pie crust, but this time, I’m reprinting it below with how I make it. If you’ve never made pie crust before, I strongly recommend you watch the Good Eats episode “I Pie” for more information. Scoop out the dough and squeeze into a rough disc 5″ or so in diameter. Put it inside a gallon ziptop bag and refrigerate for 30 minutes. Remove the dough from the fridge and cut open the 2 sides of the bag. Sprinkle a little bit of flour over both sides of the disc and recover. Roll out until the dough takes up all of the space inside the bag. Open the bag and place a pie pan upside down on top of the dough and flip over. (The dough will now be resting comfortably inside the dish.) Remove the plastic. Trim the edges and make a nice fluted edge or press the tines of a fork into it. If using this for a pie that requires a blind-baked pie crust, dock the pie all over and fill most of the way with pie weights or dried beans. Bake at 425F for 10 minutes or until golden brown. Remove, let cool and continue with your recipe. 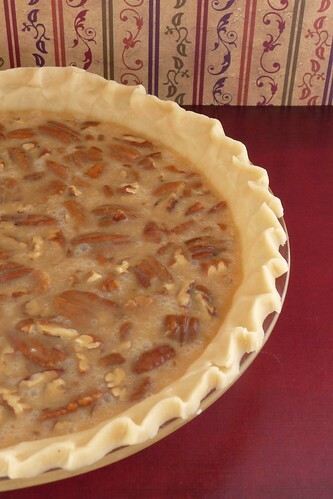 The pecan pie recipe below does not require blind baking. Melt butter in the microwave and set aside. If desired, toast pecans. In a large bowl, stir together sugar, flour, salt and baking powder. Beat eggs together with vanilla, corn syrup and melted butter. Mix egg mixture into the sugar mixture and combine thoroughly. Fold in the pecans. Pour the mixture carefully into the pie crust. Bake for 45 to 60 minutes or until the pies have swollen and then fallen. Cool on a rack for an hour then chill.